People like being outside in nature. Whether it’s going camping, spending a day at the beach or enjoying a romantic picnic, people love to connect with nature. While being outside is exciting and relaxing it can also be a hassle when a person doesn’t have modern conveniences. Sometimes it’s best to have outdoor furniture to make things comfortable and convenient. 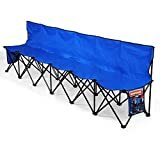 Here is a list of the top 10 best double chairs for camping and other getaway excursions into the great outdoors. 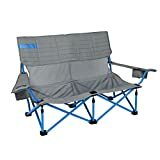 The Loveseat Style Double Camp Chair with Steel Frame is truly an amazing piece of camping furniture. 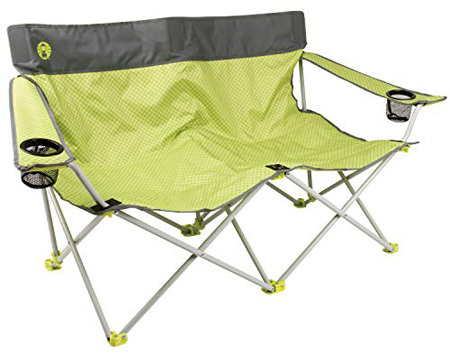 This is the type of camping chair is big and roomy. It is designed to hold up to three average sized people. However, it was made specifically for two individuals. After all, it is a love seat. This is the type of camping chair that couples take when they want to go on a date. The chair is extremely sturdy and weighs in around 40 lbs and can hold up to 440 pounds. This Loveseat is made out of a durable nylon material that is easy to clean and is extremely sturdy. You can use it for picnics, outdoor movie events and sporting games such as baseball or soccer. 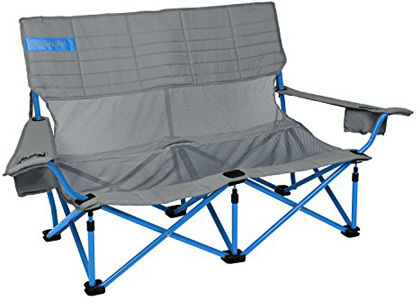 If you need camping chair to snuggle up with your partner while in the great outdoors, then the OmniCore Design MoonPhase Home-Away Love Seat is a great choice. This chair is designed to hold up to 300 pounds. It will comfortably seat 2 people and it can be adjusted for different uses. In other words, you can lean back in this double chair model or lie down with that special person. OmniCore calls this design Moon phase to shapeshift technology. Remember that this oversize loveseat can also be arranged for a single, double or triple position. Still, the unit is primarily made for 2 people. The Home-Away Loveseat is also loaded with a lot of creature comforts since it has a double quilted seat, a bottle opener and a long-lasting steel frame that can withstand pressure, wear and tear. Going on a picnic is another way that people like to relax in nature. Traditionally, most people have a picnic on a blanket. 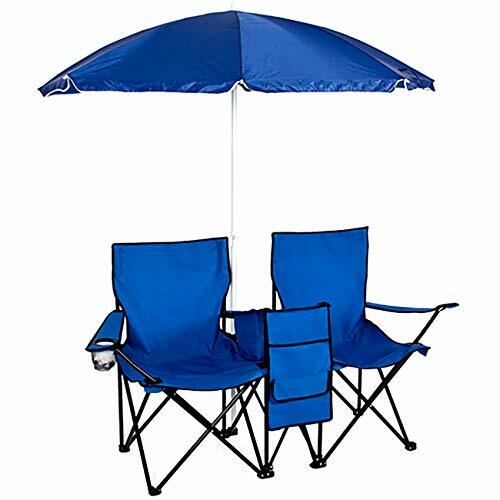 However, they can have a lot more fun with the Costway Portable Folding Picnic Double Chair W/Umbrella. This is a loaded picnic combination sitting chair. It has a table cooler where a couple or family can store their drinks and other picnic grub. More importantly, the unit has a large umbrella to keep out the blistering sun rays or the soaking rain off of people while they eat lunch in nature. Young kids can sit on the seats while mom and dad enjoy their blanket luncheon on the ground. A guy’s girlfriend will also appreciate this chair when she doesn’t want to deal with bugs or dirt. She can sit off the ground and still enjoy spending time with her man while they fill their stomachs with sandwiches, potato chips, and lemonade. There is even a durable carrying case that will allow the user to transport this great chair set with ease. It’s a great double chair with over 60” in length. Use on the beach as the name implies, a great cooler. 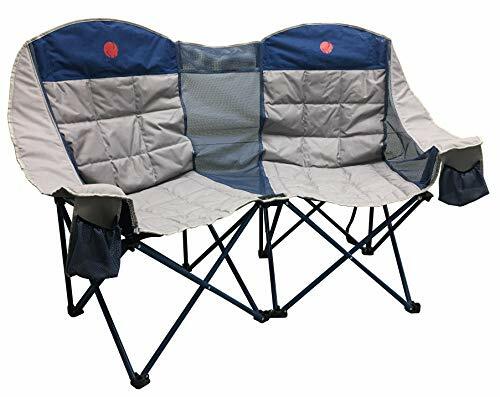 The Coleman 2000019354 Quattro Lax Double Quad Chair is a multipurpose unit that has a lot to offer for people when they enjoy the outdoors. This outdoor furniture has cup holders, back seat pockets and a durable double seat that is made for two. The unit can hold up to 450 pounds or 250 per seat. So, it is strong enough to keep the average person comfortable and secure. There are back seat pocket on the quad chair that provides storage for accessories and food that people bring with them outside. The chair can stand up to the sun and rain and it is easy to clean. This unit is a great option for sitting outside and taking in the sights. 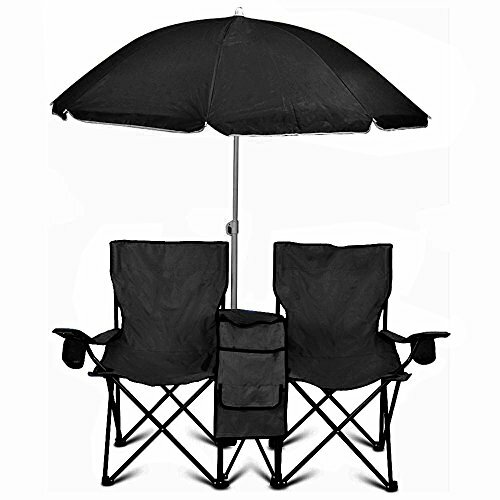 Umbrella based chairs are perfect for beaches, the pool and for backyard areas. They are useful pieces of outdoor furniture that keep people from being burned by the sun or completely soaked by the rain. The Best Choice Products Portable Folding Double-Chair for Beach, Camping, Picnic w/Removable Umbrella, Table Cooler holds up to 250 pounds and the unit is 20″ long. The unit has a great built-in cooler for people that want their drinks and snacks while they lounge around. This chair makes a great carry along piece to most outdoor gatherings. An outdoor chair that can hold up to 300 pounds is a great piece of furniture to carry around. 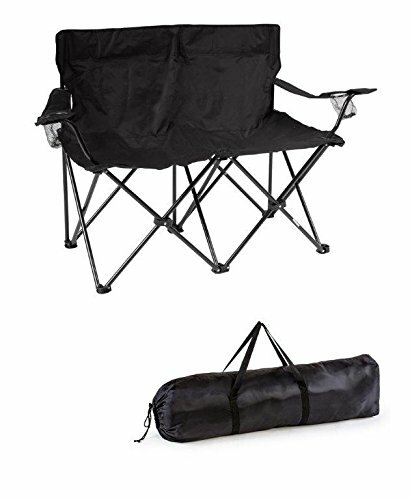 The Go Team Portable Double Folding Chair w/Removable Umbrella, Cooler Bag and Carry Case is an extremely robust piece of outdoor furniture. This is a great chair for tailgating or for the backyard barbecue. It has a cooler bag for drinks and snacks and it also comes with an umbrella for keeping a person shielded from the elements. The Double Folding Chair also has a carrying case and weighs in at 13 pounds. This means the unit is easy to transport and even easier to set up. This chair provides instant comfort within most outdoor areas. The Topeakmart 600D Oxford Double Layer Fabric Folding Sport Bench is designed exclusively for 6 average sized adults. This unit can hold up to 10 kids because it is about 9 feet long and each seat can withstand 200 pounds. So the chair can withstand 1200 pounds of weight. Another amazing thing about this chair is that it is long and extremely durable. It can take the wear and tear that most people put on seats and still remain in good condition. Larger sized people who weigh 250 and over can also be seated but fewer people will have to occupy the unit to maintain weight limit. The Oxford Double Layer Folding Sport Bench is very portable and it does not require any assembly. All a person has to do is unpack the bench from its carrying case and pull it out into position. When an event is done, users simply fold the chair back up and carry it away. The double layer fabric provides extra protection and the storage pockets allow people to pack goods such as notebook computers, tablets or even drinks. 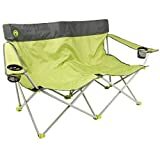 If you want a rugged outdoor chair that is made for couples then the Kelty Mesh Low-Love Seat Camping Chair – Portable, Folding Chair for Festivals, Camping and Beach Days is what you need. This furniture piece has beverage holders and is easy to pull up and to collapse down. The unit can hold up to 500 pounds which means a couple can get real cozy without having worry about it breaking apart. Users can adjust the Low-Love Seat Chair into different positions. The backside of the unit is made out of mesh which improves airflow. The unit will help to keep people cool during hot and humid days. 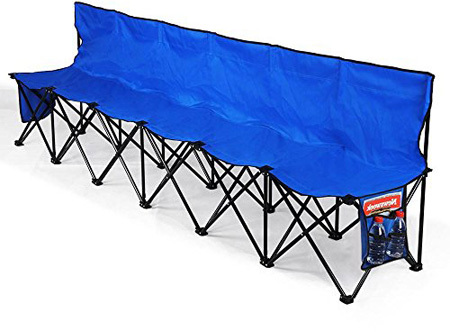 The Kelty Mesh Low-Love Seat has an easy to control roll-up design that will allow people to efficiently travel with this unit. The Loveseat Style Double Camp Chair with Steel Frame by Trademark Innovations is small but extremely strong. It can hold up to nearly 500 pounds. This means that 2 people can sit comfortably on the unit. It is a strong portable chair that can be used in rugged environments because it won’t easily tear up, break or rip. The seating is made out of a durable polyester material and it is very comfortable for relaxing. This is one of the top 10 best double chairs camping that people can use. 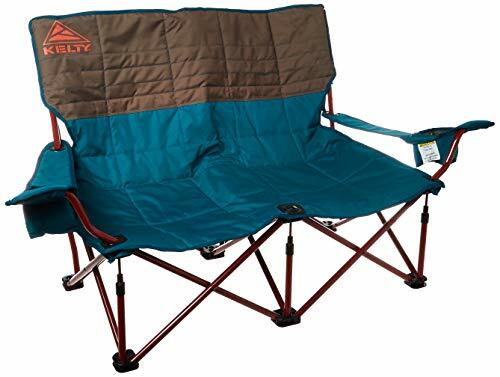 The Kelty Low Loveseat Chair has armrests for added comfort. It also features a beverage holder and has a unique color design. This unit is also a reclining piece that provides support at different positions. It has roll-tote storage that will allow a person to easily transport around. This unit can withstand 500 pounds and it is a great outdoor piece to take to many different places. 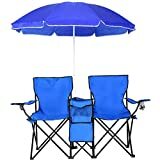 Double chairs for camping make a great piece of equipment for any outdoor camping trip or excursion. They are lightweight, durable and can help people to find the comfort they need when they are outside. These outdoor furniture pieces will make any outdoor trip a more rewarding and fun experience.